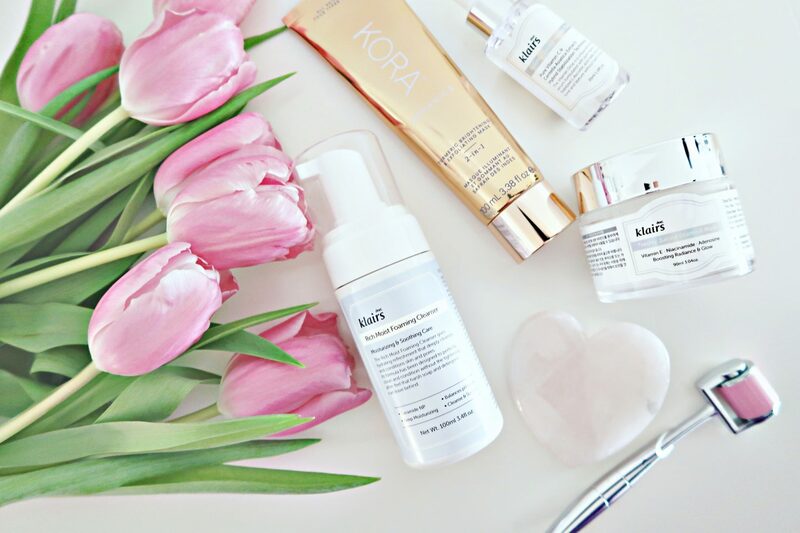 It´s been a while since I shared my skincare routine. This one however I´m super excited about sharing! I´ve had this routine now for a few months now and it´s done a huge difference in my skin, so I know for a fact it´s working amazingly. I might do a before and after for you soon. Previously I mentioned that I like to use the same brand for the most part of my routine since they are ment to composition each other and I still find that to be true. Everyone has different skin, so because this works amazing on my skin, it may be different for you. My skin type combination skin, so if that´s what you have, this might work for you too! The best advice is to test things out and find what works for you! After removing any makeup I always start my routine with a cleanser. 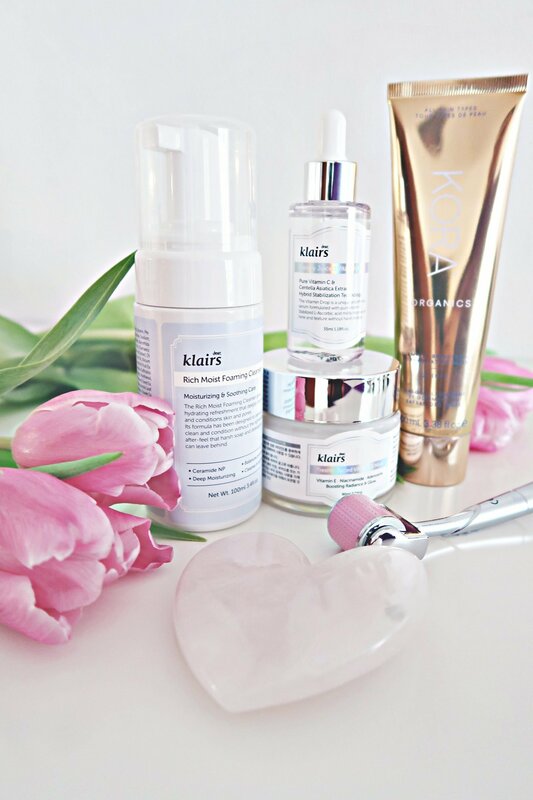 Right now I use the foaming cleanser from Klaris. I just started using it, so I haven´t tested it out enough yet to know if I like it. However, my first impression is that it hydrates but still cleanses really good. It´s soothing on the skin, and it´s supposed to balance the PH levels. So far so good! And I thought it would be perfect for winter to get some extra moisture. Every other night I exfoliate my skin before bed, right now I use Kora Organics turmeric exfoliating scrub/mask. This is a holy grail product and it´s my 3rd bottle. It´s just get´s in every single pore and clean it properly like no other. I usually put it on a dry face and let it sit until it´s almost dry and then wash it off. The result is a super smooth skin and makes a great foundation for the next step. After cleansing, I like to use a vitamin C serum during the day. Believe me or not I actually have not used a serum in many years until I discovered this on from Klairs. So happy I decided to try it out because it´s amazing! This specific one is a highly concentrated vitamin C which makes it great for protecting the skin from free radicals and pollutions. The serum is also supposed to minimize wrinkles and pigmentations while increasing the skin´s elasticity. Vitamin kick on a bottle! After my skin is all prepped I finish it off with my holy grail moisturizer. This is probably my 3rd or 4th box of this amazing product! It says it´s a facial mask, however, I use this as my moisturizer. Just the perfect moisturizer for my skin type and after the first week of trying this one out, I promised myself that I will never buy another moisturizer ever again! It has a gel consistency, and are very hydrating for the skin but at the same time, it´s lightweight. It´s perfect under makeup. Vitamin bomb for the skin. Holy Grail product right here. After I started with this skincare regime, I have not felt the need to go to an esthetician or a professional. However, I like to do some treatments myself and there are two things that I love to do to give my skin some extra attention and love and that is Gua Sha & Micro Needling. Gua Sha I like to do in the morning when I put my serum on to really massage it into my skin. It´s honestly like a workout for the face or a botox without injections, lol. Micro Needling I have not been so consistent with lately, however, it´s an amazing treatment to treat any scars and wrinkles on your face and make your skin more plump and youthful. I wrote a whole blog post about it last year on how it changed my skin in ONE WEEK, check it out HERE. One to two times per week I like to treat myself with some sheet masks, and I just wrote a post about that HERE on my top 4 favorites! I use it after exfoliating to really get most out of it. That completes my winter skincare routine of 2019! 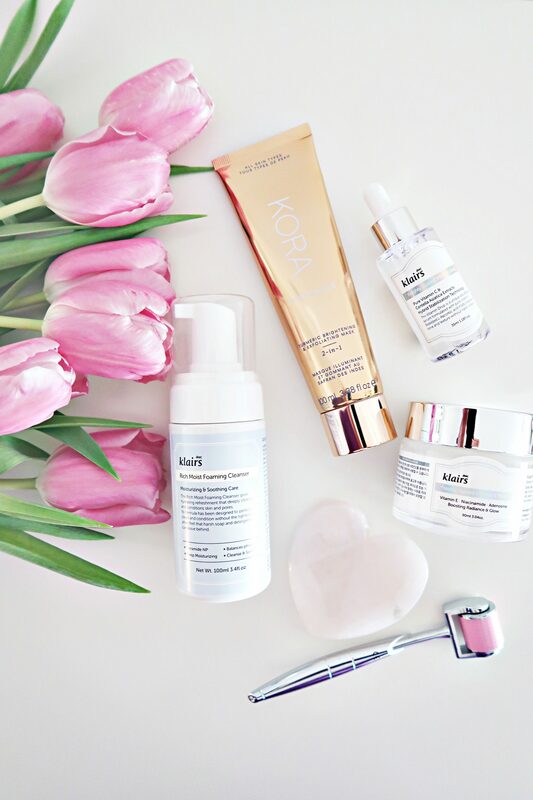 I love this regime so much and are always excited to treat my skin with these amazing products. What is your favorite skincare brand? I would love to know! YAASSS girl living for this routine! I love your blog, i;m trying to make mine more professional looking like your, any tips?? ?